Westjet Encore Bombardier Q400 C-FENY at North Peace Regional Airport (YXJ) in Ft. St. John BC, under a beautiful blue sky. This was going to be a great day for AirlineReporter.com’s Canadian “Senior Contributor.” That would be me! I was flying with a new Canadian airline in a brand new Canadian-built plane, traveling from a major Canadian airport over some stunning Canadian landscape, and visiting the headquarters of one of “Canada’s 10 Most Admired Corporate Cultures,” which happens to be a major Canadian airline. The Flight Attendants might have made it even more Canadian by greeting me at the plane’s door with a Tim’s “Double-Double” and a hockey stick. That didn’t happen. Translation? I’m flying with Westjet Encore on a Bombardier Q400 from Vancouver (YVR) over the Canadian Coast Range and Rocky Mountains, and visiting Westjet’s base in Calgary (YYC). I’ll leave it to you to find out about Tim’s. 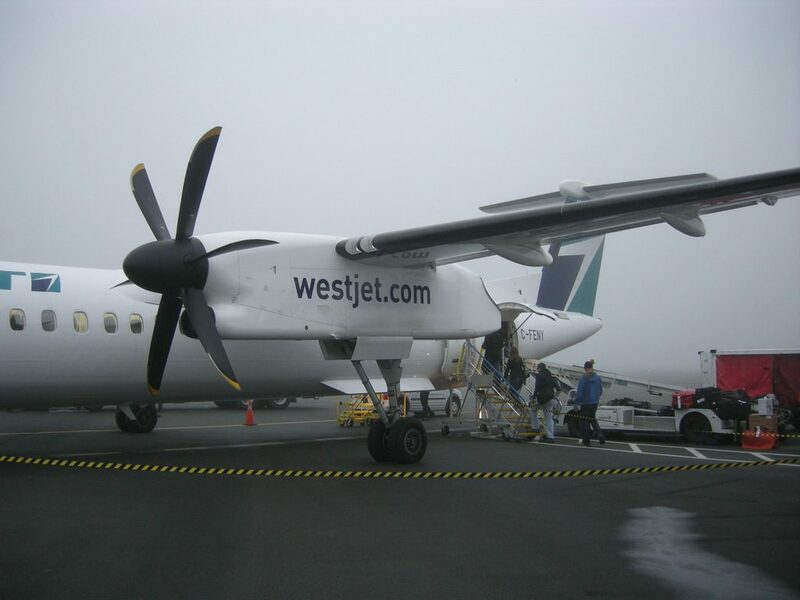 Westjet Encore began flying in late June with two 78-seat Bombardier Q400 NextGen turboprops. Since then, five of their initial order of 20 Q400s have been delivered, and they have options on another 25 planes. Westjet Encore augments Westjet’s Boeing 737-based route structure with regional flights of distances up to 700 miles. That’s about a two hour flight time for the Q400, but most destinations are 60 to 90 minutes apart. 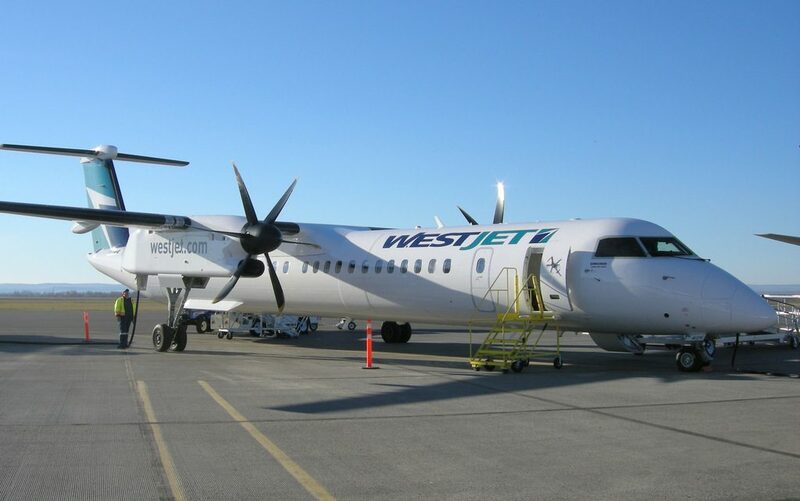 Having the Q400 in the fleet will give Westjet the flexibility to fly to new destinations, add additional frequencies to current destinations, or “right size” the service throughout their network by swapping 737s with Q400s. The Q400s are pretty quick, with flight times within 10-20 minutes of a 737 over these short distances. The first destinations included Nanaimo, BC in the west, and as far east as Saskatoon, SK. As more planes come into the fleet, Encore is adding destinations and continuing their expansion eastwards. Encore brought Westjet service back to Brandon, MB in September, a destination that previously couldn’t support WJ 737 service. This YYC-YBR flight is currently Encore’s longest, at a bit under 2 hours. In addition to adding direct regional flights to the Westjet schedule, Encore will look to keep travellers “in the family” by providing connections to mainline WJ flights, and those operated by codeshare partners. Encore is also part of the “Westjet Rewards” frequent-flier program, and shares facilities with WJ at common destinations. Boarding WS3102 on a foggy YVR morning. The Vancouver region was in the midst of a days-long period of heavy fog and low clouds when I arrived for my 8:15am (PT) flight. I was booked on Westjet Encore WS3102, from YVR to Fort St. John, BC (YXJ). I’d be doing the turn at YXJ and continuing on to Calgary on the same plane, under flight number WS3100. I had checked in online, and although I could have gone straight to the gate, I paused to watch the action at the Westjet area in the YVR domestic terminal. There are 22 self-serve terminals that Westjet guests (not passengers) can use to get their boarding passes and baggage tags. There was a roving team of six “Westjetters” helping their guests use the terminals, speeding up the check-in process. It seems to work – in spite of it being the morning WJ eastbound and regional “push” from YVR, neither the check-in nor the baggage drop line were particularly long. My flight was leaving from WJ’s domestic zone in “A” pier, and I cleared security and made my way to the gate around 7:30. Boarding began at about 7:50, down the stairs to a ground-level departure corridor. Encore uses both the front and rear doors for boarding their Q400s. I was in Seat 17A, and I made my way to the back door. The Q400’s overhead bins are somewhat limited in size, so guests were asked to drop their large carry-on bags on the planeside “Go Cart”. These bags would be last on, first off, and back on a cart at the destination. Flight WS3102 was operated by Encore’s newest Q400, registration C-FENY, fin #405. Inside, it’s a bright, beautiful new plane, with LED lighting and low-profile leather seats. It still had that “new plane” smell! 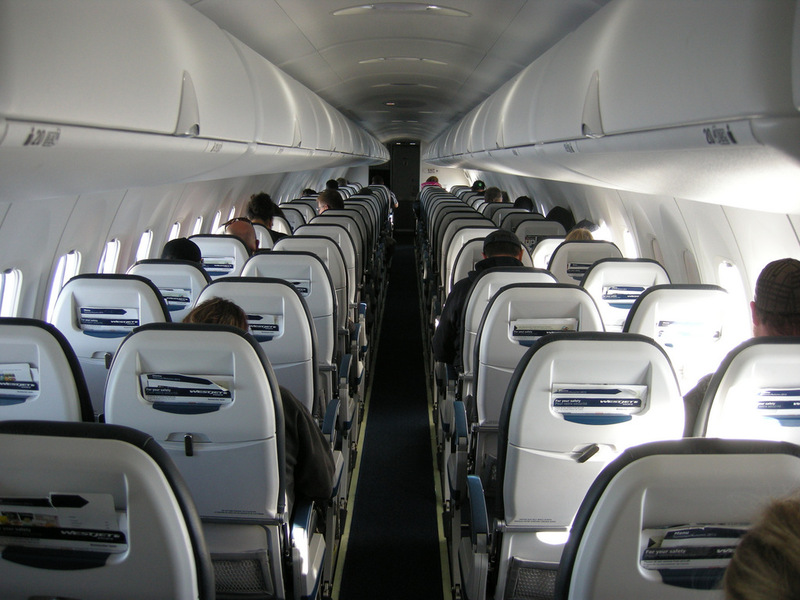 Depending on the row, seat pitch is between 30-31″, and the seat width is 17″. The seats are comfortable and have a bit of recline. 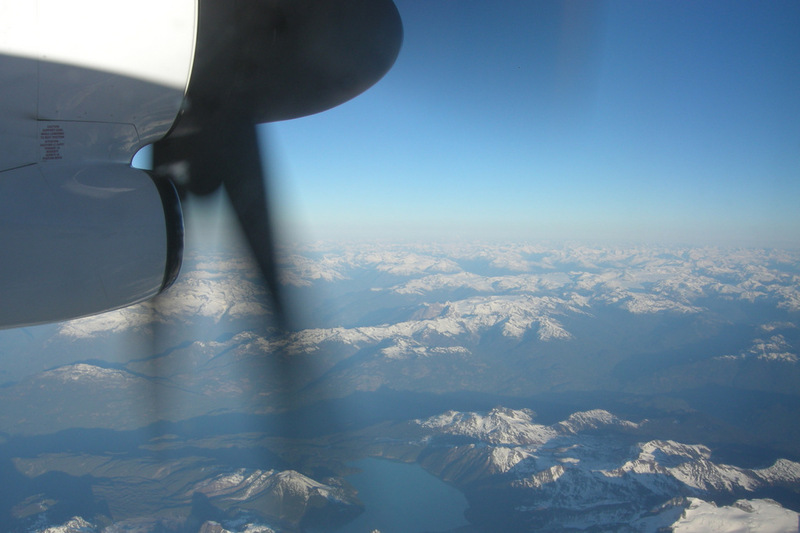 With the Q400’s high wing, the views in flight are great from every row, although the engines, props, and landing gear get in the way on the ground. The Q400 is quieter in flight than you might expect for a prop plane, and the cabin is a nice place to spend a couple of hours. The load to YXJ was only 31 guests (out of the Q400’s maximum capacity of 78). WS3102 had the “A-Team” of Flight Attendants. Ashley and Andrew gave us the required pre-flight briefing, with Westjet’s usual light-hearted touch. “Andrew will be doing the hard work, and I’m here to look pretty”, said Ashley. A pre-recorded briefing followed in French, Canada’s other official language. Captain Matthew and Captain Mike were in command of WS3102, and the crew had started their day with a short flight from Victoria, BC (YYJ). With the doors closed and engines started, we turned and taxiied from the gate on-time without the need for a push-back. The taxi to YVR’s Runway 06R was surprisingly quick, and we took off at 8:18. After a 30-second roll, the Q400 levitated, climbed into the fog, and punched into the clear sky above. A left turn set us on course for YXJ, passing downtown Vancouver, over the Coast Mountains, BC’s Interior Plateau and the Rocky Mountains, then on to Fort St. John on the northwestern edge of Canada’s Prairies. Amazing views, and “severe clear” for the whole flight! Ashley and Andrew began the in-flight service about 20 minutes after departure. In addition to the usual hot and cold beverages, Encore offers food-for-purchase and complimentary beer and wine. After they finished the first service, we chatted a bit about their experiences with Encore. Andrew and Ashley are both hugely enthusiastic about their airline, and excited to be part of the “start-up” crew. Their passion and focus on their guests was clear. They love the new planes, too. Cruising altitude was 24,000 feet, and I moved a bit forward in the cabin to get a couple of photos with the prop in the frame. Ashley reminded me to move back to my assigned seat for landing. As with every plane, the Q400’s “weight and balance” is critical to flight safety. And with less than a full load of guests, where everyone sits is an important factor. After taking my photos, I moved to the front of the plane to use the Q400’s compact lavatory. Just enough room. Barely. I found it interesting that there was a placard above the sink – “Wash water sys deactivated – do not use”, with a pile of wet wipes in the sink. I asked Ashley about it, and she said that it was part of the winterization of the Q400. This is an Encore operational decision to reduce the chance of the water system freezing up when the planes overnight on a frigid airport ramp. Other Q400 operators do the same. A bit surprising for a Canadian-made plane, but Bombardier is working on a fix. Descent to Fort St. John’s North Peace Regional Airport began about 20 minutes before our smooth landing on Runway 29, at 9:54. We were on the ramp and shutting down 3 minutes later. It was busy at YXJ, with a Hawkair Dash-8, an Air Canada Express Q400, and a Flairair 737-400 (which was likely a charter for workers coming or going to the region’s “oil patch”). It was a quick turn. With light winds, what was now WS3100 took off at 10:30 to the southeast on Runway 11. We were pretty well right on course for Calgary. It was another light load, with 47 guests on board for this leg, and Andrew and Ashley began their service soon after takeoff. The flight route paralleled the eastern edge of the Rocky Mountains, and there was a howling tailwind. The distance from YXJ to YYC is 449 miles, and we covered it in just over an hour. As we went past YYC and began the expected bumpy approach, I was able to see the airport’s new International Terminal under construction along with a new 14,000 foot long runway. The new Runway 17L/35R and taxiway system is scheduled to be in-service by May 2014, helping Canada’s 4th-busiest airport keep pace with growth. The new 22-gate terminal will open in October 2015. 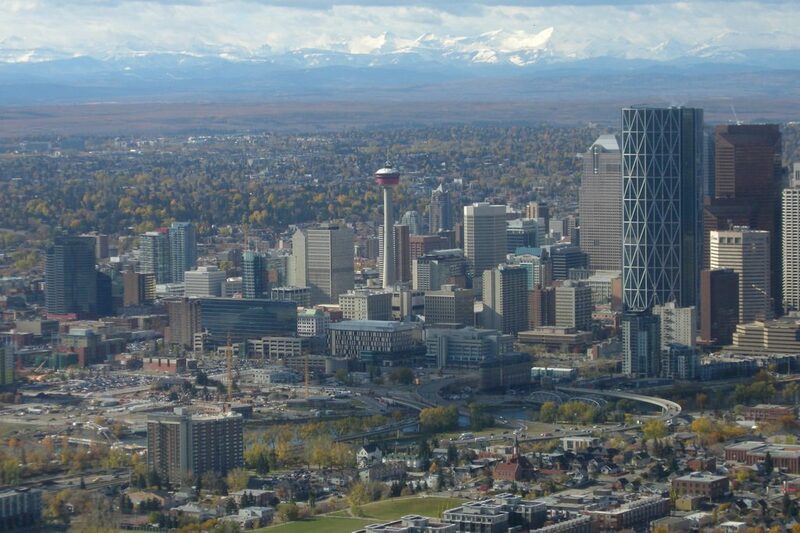 With a left pattern for approach, I was able to get some great shots of downtown Calgary as we were tossed around by the winds. Great work by the pilots, though, as we touched down on YYC’s Runway 35 with barely a bump at 12:35pm (MT). YYC is a big airport, and Runway 35 is 12,675 feet long, so it took a while to get to the ramp. We were parked with the props spinning down at 12:48pm, about 12 minutes ahead of schedule. My flights with Westjet Encore were a great way to spend the morning – as an AvGeek, what’s not to like? A brand new plane, enthusiastic service, great views, and 3 airports. But regular travellers will be looking for a selection of flights, on-time performance, reasonable fares, and easy connections. It’s still early days for the airline, but it looks like Encore is working hard to provide all of that for their guests. Encore’s major competitor in the west is Air Canada Express, which has been upgrading their fleet by adding new Q400s. AC Express has a many-decades long head-start in the region with direct and connecting flights, and certainly won’t be sitting idle in the face of new competition from Encore. And as Encore expands eastward, they’ll not only have AC Express to contend with, but Porter Airlines, too. Q400s, everywhere! Note: I was a guest of Westjet Encore and my flights were provided by the airline, but the story, opinions, and photos are mine. All rights reserved.